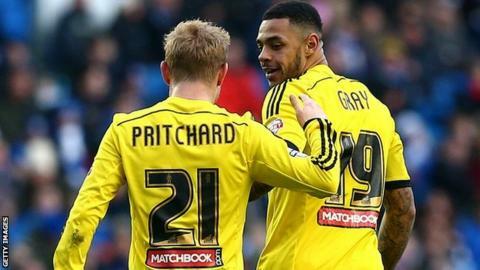 Brentford strengthened their Championship play-off charge as an Alex Pritchard strike sealed victory at Leeds. The hosts, who had not lost in their previous four games, had a number of penalty appeals turned down before Pritchard struck at the far post. Billy Sharp had Leeds' best chance when he hooked a shot just wide. However, the post denied Brentford a second through Arsenal loanee Jon Toral's shot. The result means Brentford are fourth with 52 points, four behind third-place Middlesbrough. Leeds are 20th, five points above the relegation zone. The hosts will perhaps feel aggrieved they did not get at least a point, with referee Graham Salisbury waving away three penalty claims. Their first appeal came just before the break, when Rudy Austin stumbled in the area after a shove from Moses Odubajo, before Austin again fell in the area just after the break. Sharp had an unsuccessful penalty claim just before the hour, a decision that agitated Leeds fans when Brentford struck soon after as Pritchard arrived at the far post to turn the ball home. Toral then smacked a shot against the post as the away side pressed for a second but Leeds upped the tempo in the closing stages. Sharp fired wide before the Bees' defence had to withstand some strong pressure to secure the result. "When you get decisions going against you constantly throughout the game you are fighting with one arm behind your back. "Refereeing is a really tough job and I understand that, but with 50-50 decisions you have to show some parity. It can't be one way all the time. "I didn't have a clear view of the first penalty incident but Rudy Austin said it was more a penalty than the second, which I saw and that was a definite foul. "There is no point in me going in there ranting and raving. The referee is a professional with a job to do. I will sit down with my secretary, as I always do, to give a constructive assessment of the referee and his assistants." "The referee came under enormous pressure from the crowd but he gave it as he saw it. If you look back at the game without any sound they were not penalties. "If you go down that easily you are looking for a penalty, so if that is how the referee saw it then he should have taken out his card. "It was a very good three points. In the first half we were off the pace and didn't get close enough to the opposition, but we stepped it up in the second and created a lot of chances. "People say we are direct and hard-working but we are better than that. As long as we are little old Brentford, that works for us." Match ends, Leeds United 0, Brentford 1. Second Half ends, Leeds United 0, Brentford 1. Corner, Brentford. Conceded by Lewis Cook. Stuart Dallas (Brentford) wins a free kick in the attacking half. Foul by Edgar Cani (Leeds United). Attempt saved. Chris Long (Brentford) right footed shot from a difficult angle on the left is saved in the centre of the goal. Assisted by Stuart Dallas. Attempt saved. Sol Bamba (Leeds United) right footed shot from outside the box is saved in the centre of the goal. Chris Long (Brentford) wins a free kick in the defensive half. Foul by Rodolph Austin (Leeds United). Attempt blocked. Rodolph Austin (Leeds United) right footed shot from outside the box is blocked. Foul by Harlee Dean (Brentford). Mirco Antenucci (Leeds United) wins a free kick in the attacking half. Jon-Miquel Toral (Brentford) is shown the yellow card. Chris Long (Brentford) wins a free kick on the right wing. Jon-Miquel Toral (Brentford) wins a free kick in the defensive half. Foul by Lewis Cook (Leeds United). Lewis Cook (Leeds United) is shown the yellow card for a bad foul. Moses Odubajo (Brentford) wins a free kick in the attacking half. Foul by Jon-Miquel Toral (Brentford). Lewis Cook (Leeds United) wins a free kick in the defensive half. Substitution, Leeds United. Edgar Cani replaces Luke Murphy. Attempt saved. Jon-Miquel Toral (Brentford) left footed shot from outside the box is saved in the centre of the goal. Substitution, Brentford. Tommy Smith replaces Alex Pritchard. Jake Bidwell (Brentford) is shown the yellow card for a bad foul. Foul by Jake Bidwell (Brentford). Sam Byram (Leeds United) wins a free kick on the right wing. Foul by Stuart Dallas (Brentford). Attempt missed. Billy Sharp (Leeds United) right footed shot from the centre of the box misses to the left. Attempt blocked. Harlee Dean (Brentford) right footed shot from outside the box is blocked. Chris Long (Brentford) wins a free kick in the attacking half. Foul by Sol Bamba (Leeds United). Attempt missed. Jon-Miquel Toral (Brentford) left footed shot from a difficult angle and long range on the left is close, but misses to the right. Assisted by Jake Bidwell. Corner, Brentford. Conceded by Sol Bamba. Attempt blocked. Stuart Dallas (Brentford) right footed shot from outside the box is blocked. Jon-Miquel Toral (Brentford) hits the left post with a left footed shot from outside the box. Attempt saved. Rodolph Austin (Leeds United) right footed shot from outside the box is saved in the bottom left corner. Assisted by Billy Sharp. Substitution, Leeds United. Mirco Antenucci replaces Steve Morison.